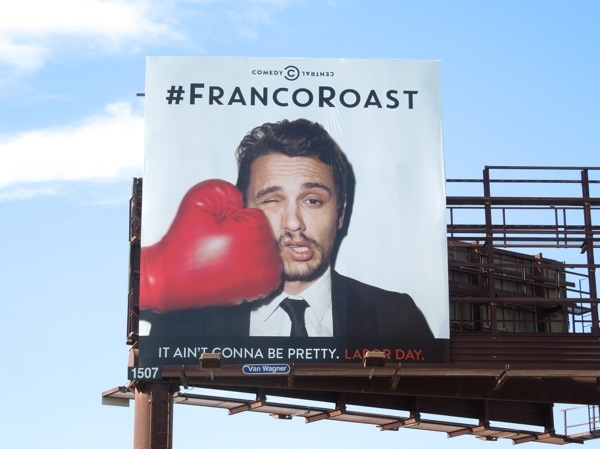 James Franco surely must be a glutton for punishment as there's no other reason to explain why he's agreed to be roasted on Comedy Central by his nearest and dearest comedian friends (let's face it the travesty of his co-hosting the 83rd Academy Awards with Anne Hathaway immediately springs to mind). 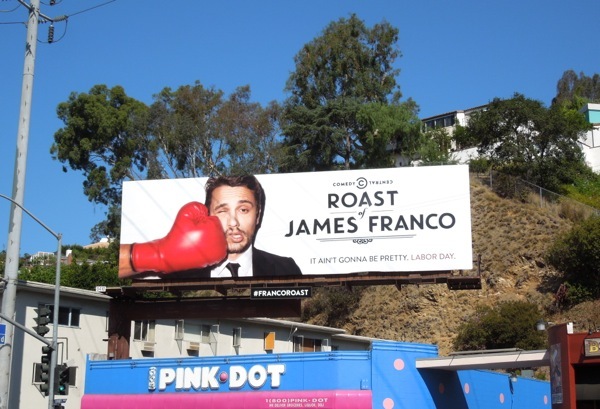 To celebrate the annual roast experience Comedy Central came up with this clever series of billboards that changed over the course of four days, creating real intrigue and passerby engagement. 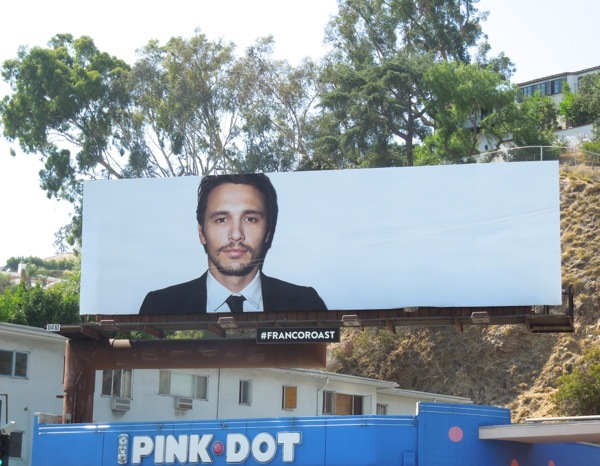 The series started on Monday August 19, 2013 with a simple blank canvas with a very dapper looking James Franco, with no copy or seeming explanation for the ad apart from a dangling #FRANCOROAST hashtag placard below the hoarding. 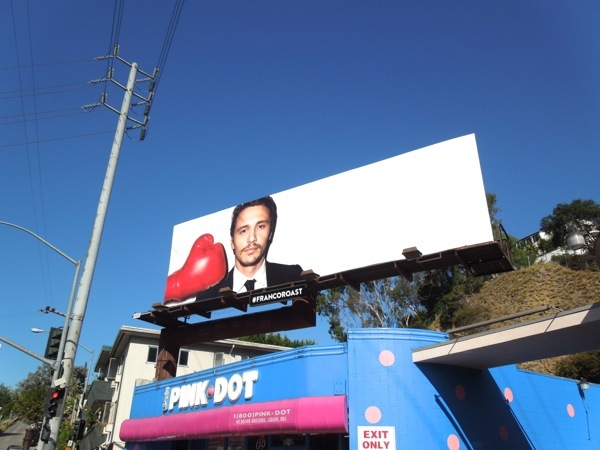 Slowing day-by-day a red boxing glove was introduced and moved along the billboard, until on day four (Thursday) when the 'punch line' was delivered and details about the comedy roast revealed (Daily Billboard could also see this working really well with a custard pie in the face). 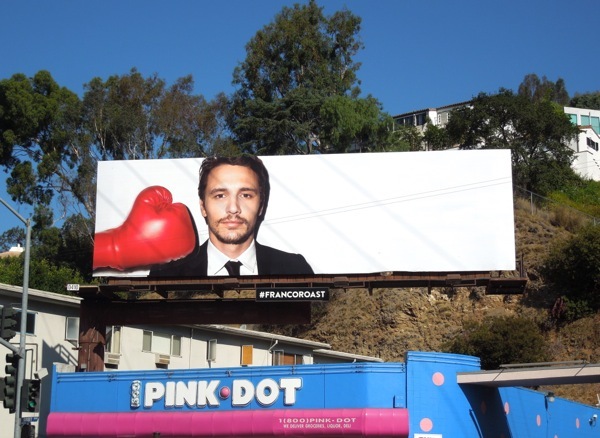 For the actor famous for such diverse movies as Pineapple Express, Spider-Man, Milk, Rise of the Planet of the Apes, 127 Hours (for which he was Oscar nominated for Best Actor the same year he hosted) and Oz The Great and Powerful, plus let's not forget his stint on the soap General Hospital, that's a lot of source material for everyone to draw upon (and that's just some of the good stuff). 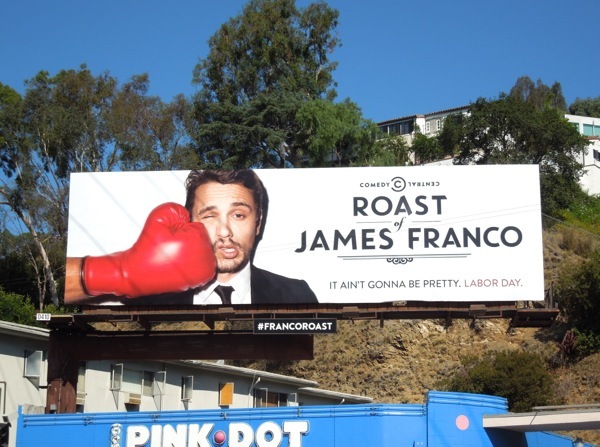 Seth Rogen is apparently Roastmaster for this Labor Day extravaganza, so brace yourselves, as this is bound to be a tad brutal and it ain't going to be pretty (unlike the man himself). 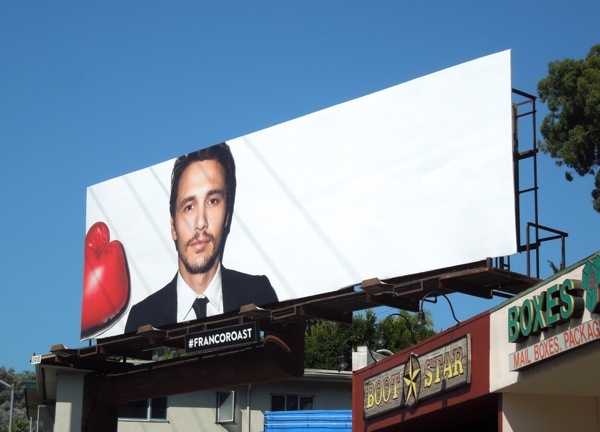 These changing billboards were photographed on a daily basis along Sunset Boulevard at the top of La Cienega Boulevard from August 19 to August 22, whilst the squarer 'boxing glove' ad creative was spotted along La Brea Avenue on August 20, 2013. 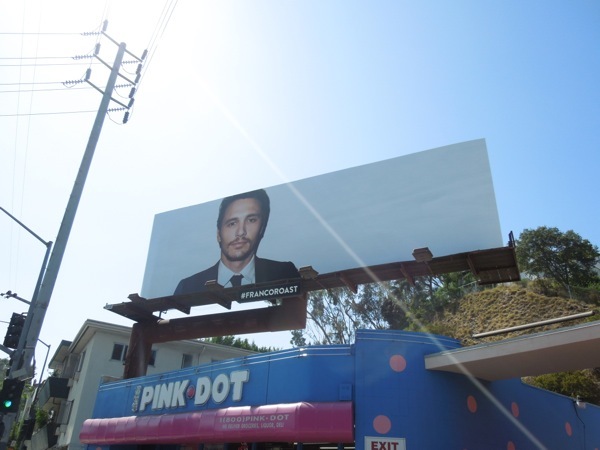 Daily Billboard's only criticism is the damn placement of those overhead telegraph wires which make it impossible to get a good clear shot of this ad site when the sun is shining on it (but still a very fun idea, which is what we've come to expect from Comedy Central's billboards). 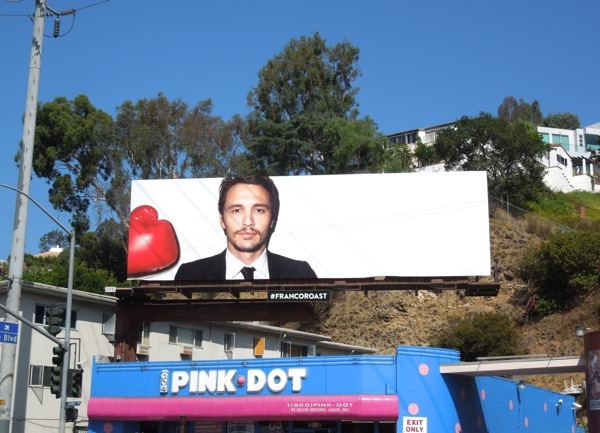 If you're an admirer of the handsome actor, be sure to also check out James Franco's Gucci made-to-measure billboard and his Gucci fragrance billboard ad. 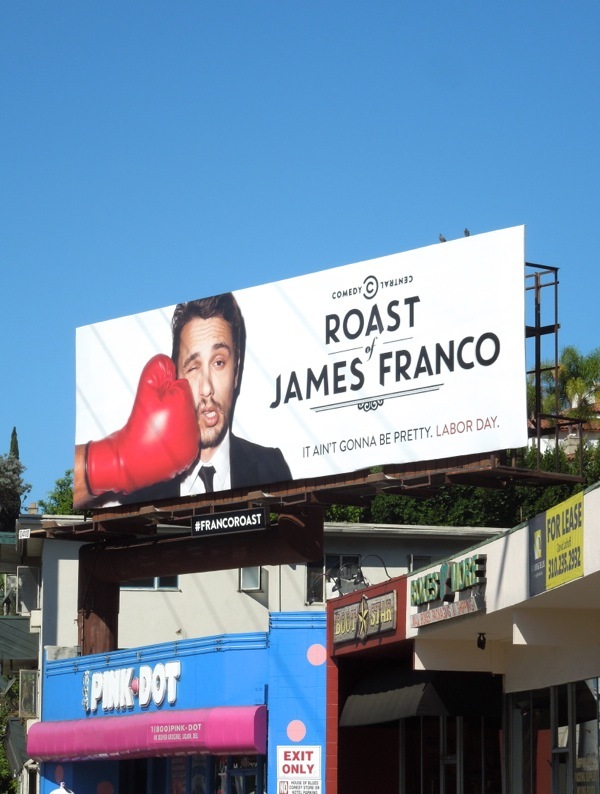 Plus for a different take on a Comedy Central roast, be sure to check out Roseanne Barr's Roast billboard from around this time last year.